I heard that this glove has pretty good leather. If someone has one and is willing to post some pics and comment on it that would be great! Thanks. A kid on my team has one. Leather is very stiff and the glove is shaped very nicely. This may sound weird but the finger pad is really cool. I have heard that the leather is good, but poor quality laces let the glove down. I haven't owned one, but if it's the case you can always relace it. I've been really interested in one of these gloves, being both a 2nd baseman and a big Yankees fan. I keep debating whether or not to get one. They look really nice. Glove looks really nice, thought someone who has the glove posted some pictures.. Or that there were more people with a Cano glove. I'm thinking about buying it too .. Looks real nice! Laces are a bit poor quality? 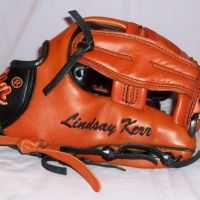 The glove is made from kip leather, dont know if thats something but sounds and looks good, price is good too!